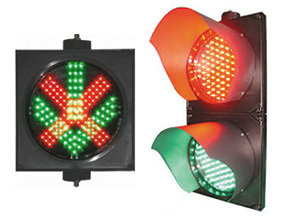 Single LED traffic light, Red cross +green arrow, full set with outer housing, diameter 200mm/300mm. Red/Green traffic light, full set with outer housing. Working tmep: 35-70 degree centigrade. Housing material: PC Plastic anti UV material.